Jim Curry was appointed to the athletics department’s executive leadership team and named Senior Associate Athletics Director in 2016. In his current role, he provides direct oversight for both the compliance and equipment office, and serves as the sport administrator for football, men’s tennis and women’s tennis. Curry joined the Seminoles in 2011 as the Assistant Athletics Director for Compliance, having previously served in the same capacity at the University of Maryland and Coastal Carolina University. 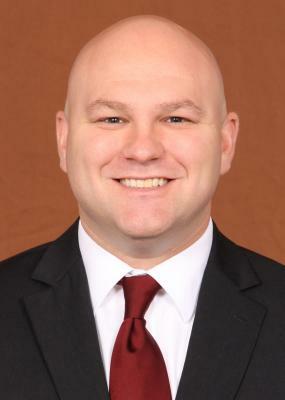 He was named Florida State’s senior compliance administrator and Associate Athletics Director for Compliance in 2012. Curry is actively involved in national governance activities. He currently serves on the NCAA Division I Initial-Eligibility Waivers Committee and the board of directors for the National Association for Athletics Compliance. He previously served on the ACC Student-Athlete Welfare Committee and the Athletics Director Advisory Group for the United States Tennis Association. A native of Gardiner, Maine, Curry received his bachelor’s degree in political science from Dickinson College where he was a member of the football team and worked as a student athletic trainer. He earned a master’s degree in business administration from Florida State University, and a master’s degree in sport management studies from California University of Pennsylvania. Jim and his wife Marisa have a daughter, Quinn, and a son, J.J.